■ADIVA was able to deliver 40 Cargo3s to Japan Post in 2011. ■The machine’s performance was highly praised, and they are still in use today 5 years later. ■However, Japan Post has requested a smaller size and lighter weight, so the model is currently being re-vamped. ■The ability for a small number of postal workers to deliver a large amount of mail was a key feature that led to adoption of the AR3 in 2011, and they are gradually being implemented as replacements for Singapore Post’s current lineup of postal bikes. ■As of 2015, around 250 AR3s had been delivered. 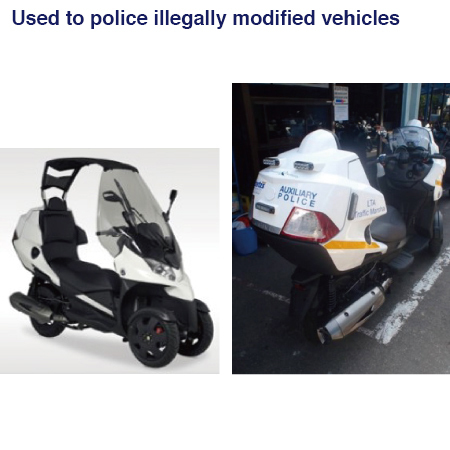 ■Both the AD3 and AR3 models are being used by the Singapore Police Force. ■The AD3 is serving in the regulation of illegally modified vehicles. ■The AR3’s employment is extremely unique. It serves as a Mobile Enforcement Vehicle(MEV). MEV: Two camera recorders are mounted on the rear (L/R) of the AR3. 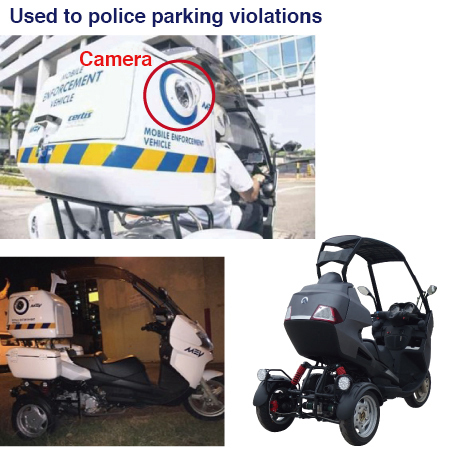 The police officer need only ride around Singapore’s city centre and the cameras will automatically record the licence plates of illegally parked cars. After returning to the station, the system generates payment forms with the appropriate fines and sends them to the vehicle owners. Owners can use the payment forms to settle their fines at convenience stores, which means that this highly effective regulation of parking violations can be done with minimal manpower.